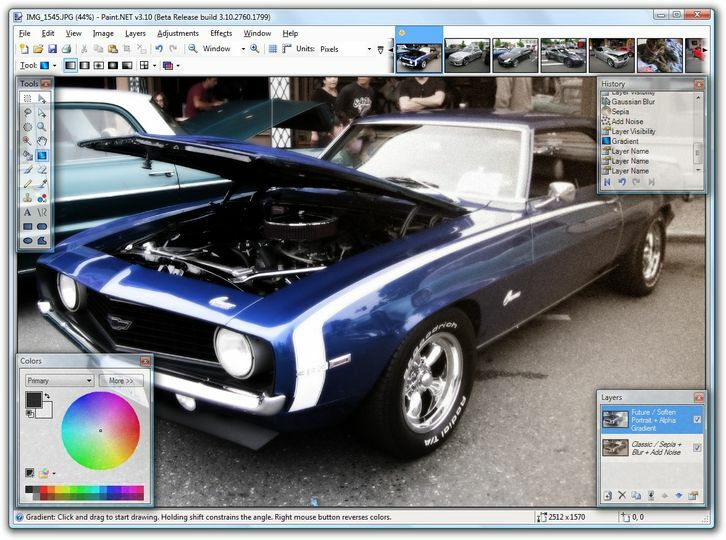 Paint.NET is the new way to easily create and edit photos for a variety of purposes. Maintaining some of the best features of the original MS-Paint application, Paint.NET also includes new, powerful tools. Such new tools include a history storage for undos and redos, and powerful multi-layering which is often seen only in high-quality, expensive photo-applications. This product was engineered with the latest in graphics and coding technology such as the new C# language from Microsoft, and the GDI+ graphics libraries. These programming frameworks allowed for the creation of a speedy, responsive application with an amazing array of graphic capabilities. While the details of the code is not important for the end-user, you will surely be amazed at the usability and power of Paint.NET. Used this software instead of MS Paint on another laptop for almost a year. Now installing on this computer because it provides more options than Paint. Forget the responses posted below . . . I have been using Paint.Net for well over 2 years now and I can report that this is an excellent image and photo manipulation program (think PhotoShop)with absolutely no hidden spyware, spamware or adware whatsoever. <b>WARNING</b> There is a <u><b>TROJAN DOWNLOADER</u></b>here!! <br/>It is either in the program itself or in the site it connects to for the Net.Framework3.5 profile client. Helppo oppia käyttämään ja melko kevyt. Löytyy kaikki mitä olen tähän mennessä tarvinut. Kuvien croppaaminen ja muu härveltäminen onnistuu helposti. V.3.36 pelittää hienosti ja suomen kielitukikin löytyy. Ohjeet sivun alalaidassa. Tuntuu pelittävän mainiosti. Asensin v. 3.36 eikä mitään ongtelmia. Suomenkielen tukikin löytyi Käyttäjä: emp500 ohjeen avulla. Yeah, this doesnt work at all for windows 2k. Not bad at all. Originally a project with some University kids and MS engineers to serve as a free replacement for MSPaint. While it's no photoshop, for simple little things it's perfect.